Here's something you never knew you needed in your life—a sausage-themed reality TV show brought to you by Johnsonville and Droga5. The three-part series, titled Sausage Dome, is similar to competition shows you might see on the Food Network (think Chopped). Instead of weird ingredients in baskets though, Sausage Dome asks contestants to make a game day-appropriate recipe using Johnsonville sausages. Each week features three competitors—most are Johnsonville enthusiasts who interact with the brand often on social media—with one winner per episode. Not only does the winner score a year's supply of sausages, but the winner's recipe will also be entered into Johnsonville's "Big Game Binder" recipe book and will be integrated into future Johnsonville print and digital campaigns. "You want to give each recipe time and a chance to be judged by the Sausage Six, but at the same time you don't want to overwhelm people with a million different recipes. We thought three was the perfect number and from those we could pick a champion and have one become an official sausage snack for the Big Game," Chris Colliton, Droga5 associate creative director, said. 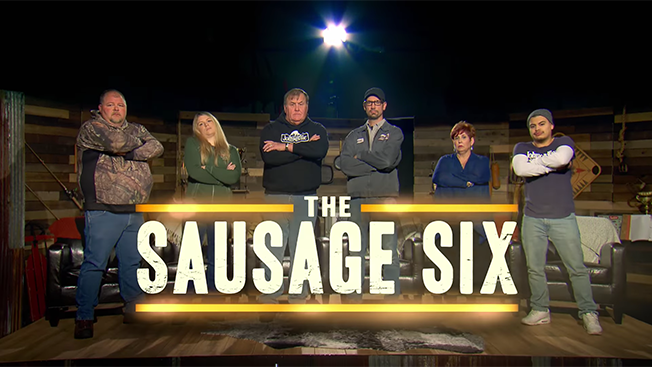 The best part of the show though is that six Johnsonville employees, appropriately named "The Sausage Six" for the purpose of this competition, serve as the judges. There's Bob from sanitation, Sandy the receptionist and even Jarrod the smoke house operator. The criteria to become a judge was pretty simple, too: be an employee at Johnsonville and have absolutely no judging experience. "They were great sports about it. We've got people from all different ends of our organization and watching them do it was really funny. They just kind of tasted it and said what they thought. It was no more complicated than that," Jamie Schmelzer, integrated marketing director at Johnsonville, said. The Sausage Dome series isn't the first time Johnsonville members have made an appearance in the brand's marketing either. Last year, as part of the "Made the Johnsonville Way" campaign, employees of the company helped Droga5 come up with commercial ideas, and the end results were quite funny. Droga5 wanted to continue down this path in its latest work. Each episode runs around 10 minutes long, which at first, seems a bit much. Yet, for any fan of a competition-style reality show, Sausage Dome becomes somewhat addictive. You want to know what's going to happen next week. Who wins. Who loses. Who walks away with that massive sausage link necklace. Each episode even features a dramatically cut preview for the next episode, similar to something you might see at the end of an episode of The Bachelor. While the campaign touts the Big Game, you won't see Johnsonville making an appearance during the actual game. As associate creative director Kevin Weir explained, on the day of, things are "already pretty cluttered and it's hard to get any attention." A three-part series made more sense, especially for a brand that's hoping people will purchase the product ahead of game day for any Super Bowl festivities. "From a functionality standpoint that's when people are going to need to get their recipes in order for what they are going to make for their Big Game party. It's also just tough to compete on that stage and we don't really have to. A three episode reality show doesn't necessarily belong on the day of, it belongs in the lead up," Weir added. Keep an eye out for two additional episodes of the show, which will roll out leading up to the Super Bowl on Feb. 5.